UK – MALAYSIA – As Multimodal 2016, the UK’s premier freight and logistics exhibition draws closer, shipping lines, forwarding agents, ports and suppliers are all gearing up for the show at the NEC Birmingham which runs 10 -12 May. 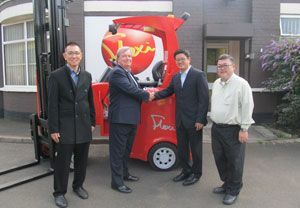 One regular supporter is Narrow Aisle Ltd. manufacturer of Flexi articulated fork lift trucks, and the company will use the show to demonstrate its latest offerings, just as it announces a major success in the export market. Cold Chain Storage Network (CCN), one of Asia’s leading temperature controlled storage and distribution specialists, has replaced the existing articulated lift truck fleet at its Malaysia facility with 8 new Flexi AC CS articulated forklifts designed and built by the West Midlands based firm. The fleet of articulated trucks will operate at CNN’s 200,000 square foot, temperature-controlled warehouse located in the Malaysian state of Selangor. The facility offers chilled, frozen, deep frozen and ambient storage facilities to a host of customers and is one of the largest temperature-controlled storage sites in the region and the Flexi AC CS fleet will be supplied and maintained by Prestar Marketing, part of Narrow Aisle’s global distributor network. A leading light in the field of materials handling equipment in Malaysia and Singapore, Prestar has been distributing, renting and servicing forklifts and warehousing equipment in the region for many years. With the cost of cold space always at a premium, Flexi equipment has proved very popular with many of the world’s leading cold store operators. The truck’s ability to increase conventional pallet storage space by up to 30% compared with reach trucks, combined with its VNA aisle performance in modern power mobile rack systems, has dramatically reduced cold store warehouse logistics costs for many users. The Multimodal event gives Narrow Aisle the opportunity to promote several of its products and the company will again be appearing alongside other logistics and supply chain specialists on the UKWA Pavilion at this year’s exhibition. Visitors can check out both FlexiPiCK, and Flexi StorMAX systems, as well as the latest articulated trucks, at the event. FlexiPiCK is a layer quantity customer order picking system that typically allows over 1100 cases per hour to be mechanically picked by one operator. The system allows users to take advantage of the increasingly popular layer quantity order picking concept pioneered in the USA, but without the need to invest in high fixed cost guided or automated handling technology that previous layer picking systems have relied upon. StorMAX meanwhile is a warehouse management system-based (WMS) storage solution that, in comparison with storage systems served by conventional reach trucks, allows an amazing 50% more pallet locations to be achieved within the dimensions of a store.